Campaigners Training Day – THIS WEEKEND! Our co-hosted Campaigners Training Day has come around so quickly that this weekend on Saturday it will be here! We are hastily getting our workshops polished off, finalising running orders and of course booking in the lunches, and although it’s looking like it’s going to be really buzzing there, are still a few free spaces available. Get yourselves booked in on the Eventbrite page here. This Saturday March 3rd, things will kick off around 10:30am where we will gather at the uber cool Whisky Bond for a couple of talks from interesting people including Cllr Anna Richardson, and then break into groups for workshop sessions hosted by a number of GoBike names you might recognise among others! 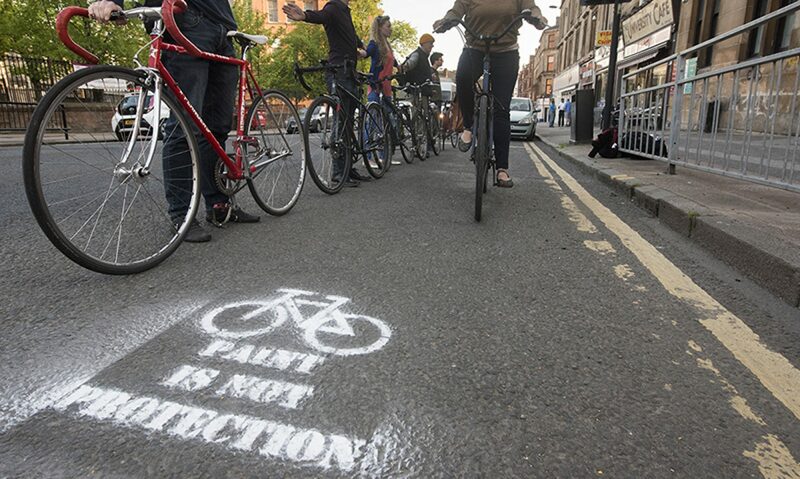 Redesigning the Designs: the Space for People Byres Road approach to campaigning – how to create design drawings, street visualisations and graphics to communicate a vision of cycling for anyone of any age and ability. This workshop would discuss the fact they have taken the existing designs and publicised redrawn versions with better “space for people” – looking at both the redesigns from a road design perspective and also a practical graphic design approach. Local Authority Cycling Strategies – Matt Davis at Sustrans Scotland supports Local Authrities to develop their cycling strategies. Matt will be sharing what makes a good strategy and what we can do to make them better. Long game campaigning – Iain Monk from the Drem/Gullane Path Campaign has been campaigning to get a vital walking and cycling link between two East Lothian villages for over 13 years. With the campaign now set to get its path built, Iain shares what it’s like to keep on going.. and going. The event is free to attend but we would welcome a contribution towards the cost of lunch and venue to make our small budget stretch further. Thanks to our co-hosts Walk Cycle Vote for putting this amazing event together and bringing it to Glasgow.